Play video Which PL boss wins the most games?Which PL boss wins the most games? Play video Which PL boss wins the most games? Wow what an end to the game, don't forget you can get all the reaction to it in our main text commentary. "Bafetimbi Gomis had done so well to get Swansea back level and then this goes and happens! "It's a deflection but Yaya Toure cuts inside on his left foot and it goes over the keeper's head. Without the touch off the Manchester City player, it's not going in." Gylfi Sigurdsson shoots but it is well saved by Joe Hart. All over. Swansea were only level for two minutes. Oh Swansea. Barely level, Yaya Toure cuts n from the right and his left-footed effort takes a deflection off Kelechi Iheanacho. How cruel. Wow, what an end to the game. I suspected another goal. But wait. Great goal. The super sub Bafetimbi Gomis collects a superb through ball and fires past Joe Hart at the near post. Fine finish. Alan Curtis goes wild. Swansea caretaker boss Alan Curtis looks pensive on the sidelines. Will his side get another chance like that? I suspect so. Swansea have the ball in the net but it won't count. Gylfi Sigurdsson chips it through to Bafetimbi Gomis but Joe Hart comes out to intercept and takes a high boot from the Swansea striker before Sigurdsson fires in. The whistle had already gone and it was the right decision. Swansea throw on Bafetimbi Gomis in place of Andre Ayew while goalscorer Wilfried Bony is replaced by Kelechi Iheanacho. Right old battle between Nicolas Otamendi and Ashley Williams, but the Manchester City defender heads wide under serious pressure. Manchester City pressing for another goal and they win a corner. Right then, who fancies this? I have to say I'm a big fan of Swansea sub Jefferson Montero. Down the other end, Fabian Delph gets time and space to shoot from the edge of the box, but he curls wide with his weaker right foot. "This has been a battling performance form Swansea, but with Manchester City's substitutions it looks like they are just turning the screw a little bit now." And Modou Barrow's first action is to be brought down by Eliaquim Mangala, who goes into the book. The subsequent Swansea corner fails to test Joe Hart. Time for Swansea to roll the dice? Leon Britton and Wayne Routledge are replaced by Jefferson Montero and Gambian international Modou Barrow. Kevin de Bruyne takes it, and Nicolas Otamendi stoops low at the near post to nod it on, but no-one can apply a decisive touch. As it stands, Manchester City are returning to the top of the Premier League. But can they hold on? Here's a free-kick from Yaya Toure, about 35 yards out, which blasts off the Swansea wall for a corner. Kevin de Bruyne has clearly found out that when you come up against the Manchester rain, no-one is keeping their hair spiky! His corner almost reaches Wilfried Bony. This time Swansea skipper Ashley Williams beats the Ivorian to it. Frustration growing from the home supporters now. Swansea are more than matching Manchester City, and always look clever on the ball. As soon as I type that, Angel Rangel crosses the ball straight into the arms of Joe Hart. Despite his mistake for the Manchester City goal, Ashley Williams is earning his corn for Swansea now. Kevin de Bruyne comes on for David Silva. Jesus Navas is seeing a bit more of the ball now but another cross from the Manchester City winger, this time a low one, is hacked clear. The home supporters are urging their team forward as Jesus Navas collects the ball on the right. But Bacary Sagna's cross is cleared. Apologies, Swansea have now had seven shots to Manchester City's six. Four of Swansea's efforts have been on target. The hosts need another goal to settle this, no doubt. Swansea have had as many shots as Manchester City, both teams with six. Another good move from the visitors, as Wayne Routledge pokes over a right-wing cross, but Gylfi Sigurdsson is offside. Gylfi Sigurdsson takes the free-kick for Swansea, and shoots on target but Joe Hart dives to punch away. That looked like it caused some bother for the Manchester City keeper, who has been the busier of the two. Manchester City right-back Bacary Sagna now goes into the book for a high foot on Wayne Routledge. Replays show he kicked him square in the chops. Double ouch. "Where were you when you were not very good?" sing the Swansea fans. Or words to that effect. Their team wins a corner but it is cleared at a second attempt by Manchester City. Wilfried Bony miscontrols the ball and catches Swansea's Ki Sung-yueng with a late tackle. Ouch. Swansea have not scored in either of their last two games. Swansea supporters are now finding their voices to the tune of The Beatles' classic 'Hey Jude'. Their team is in this. Can they turn that into something more tangible? Gylfi Sigurdsson is causing some bother down the other end too. He collects a through ball and gets a lucky ricochet, which allows him to advance on goal, but Joe Hart spreads himself at the near post to save the Icelander's effort. Swansea have had their chances in this. Yaya Toure is getting closer. The Manchester City midfielder collects the ball deep in the Swansea half and drives towards the box, but skews his shot wide and high. Swansea caretaker boss Alan Curtis and his assistants are having a good old chin wag about what to do next. Still the rain comes down. Yaya Toure fancies this, curls it over the wall and on target, but Swansea keeper Lukasz Fabianski dives to his right and punches clear. Decent effort. Down the other end, David Silva surges forward through the middle of the pitch and wins a free-kick about 25 yards out. Chance for Swansea as Gylfi Sigurdsson wriggles into the box but Eliaquim Mangala makes a crucial block. Interesting start from the Swans. Manchester City sub Fabian Delph has slotted into Raheem Sterling's position down the left flank and is trying to use his energy to inject some added purpose into this game. I reckon Swansea caretaker Alan Curtis will want to keep this one tight and then maybe unleash Bafetimbi Gomis late on? Who knows? David Silva draws an early foul in a slow start to the half. Swansea get us under way again, can they find an equaliser? The players are filtering back onto the pitch as the soaked crowd waits for a surge of excitement. Manchester City's Fabian Delph is on for Raheem Sterling. Plenty of probing down the flanks for Manchester City, but not much penetration in the box, according to this heatmap. Mark Lawrenson and music men Mumford & Sons have been predicting all the Premier League scores this weekend. You can have a go too and see if you can out-predict Lawro. Check out our Premier League Predictor here. Tweet via #bbcfootball, text 81111 (UK only - please include a name) or post on the Match of the Day Facebook page. Manchester City just edging it as the scoreline and stats suggest. But two decent chances wasted for Swansea and poor marking at a corner are the events which have made a difference. That's the last action of the half. Swansea will feel a little hard done by. Ooh Swansea's Gylfi Sigurdsson almosts chips the ball through to Ki Sung-Yueng but Nicolas Otamendi clears. Swansea may opt to see the half out now, have a few half-time words and decide how they can approach this in a different manner after the break. Bafetimbi Gomis is on the bench, don't forget. One minute of added time. Jesus Navas gets some space to have a run at Swansea left-back Neil Taylor, but the Spaniard is chopped down and loses a boot for good measure. Booking. Manchester City starting to take control now and bossing possession. Yaya Toure tries to scoop the ball over a deep-lying Swansea, who are camped on the edge of the box, but his delivery is a little too strong. Ever since John Hartson said Ashley Williams was Britain's best centre back he has been poor. Yaya Toure is just starting to pick the ball up in a few advanced positions. This time the Manchester City midfielder shoots from 25 yards and it skids through to Lukasz Fabianski. It's a deep Swansea corner, which Joe Hart opts to punch clear. As you were. Swansea midfielder Ki-Sung-yueng then draws a foul as he sprints forward. Decent free-kick position this, wide on the left. It's nodded clear by the hosts for a Swansea corner. Yaya Toure swiftly wins the ball in the Manchester City midfield, plays in Raheem Sterling but the forward is slightly offside. Ashley Williams then trips up the 21-year-old, which he's not happy about. A few words, and then they shake hands. Manchester City are starting to realise that the key to breaking down the well-organised Swansea defence is to break quickly. Alas, they haven't shown much evidence of it yet. Fairly straightforward for Wilfried Bony's goal, but the move that led to Jesus Navas winning the corner (see below), was their best of the match. "The issue is not if Wilfried Bony is good enough, it is that he is not Sergio Aguero, and that issue will always present itself. "When you know you are number two to a world-class striker, that makes a difference, and all strikers have egos - or so John Hartson tells me!" That goal has given Manchester City some confidence and of course changes the complexion of the game. Will Swansea now come out of their shells a bit more and give the hosts more space? Can Swansea respond? Andre Ayew goes close with a shot but fires over from 25 yards. "Ashley Williams is holding his hands up, he lost Wilfried Bony, who heads it really low, after losing the Swansea captain with a bit of movement. "It's not good defending and it's a shame, because the away side had been playing really well." Heartbreaking for the Swans, who made such a positive start but that is really poor defending. Wilfried Bony looked almost embarrassed to score it, and not just because it was against his former team. From the corner, Jesus Navas swings it in and Wilfried Bony nods in unmarked against his old club. He doesn't celebrate but that's his seventh of the season. Here we go, Jesus Navas goes close as he receives the ball, cuts inside and fires at the target but Ashley Williams heads over for a corner. "Swansea are having more of the ball, which doesn't really surprise me as they're playing that false nine of theirs, which gives them an extra man in the middle of the park. They're popping it around really well. "Gylfi Sigurdsson stung Joe Hart's palms with a shot but apart from that neither goalkeeper has had much to do so far." Alas the set-piece is chipped to the back post and Federico Fernandez heads clear for the Swans. Wonder what Kevin de Bruyne is thinking on the hosts's bench? Disciplined in defence from the Swans, but then Andre Ayew trips Raheem Sterling in a promising free-kick position on the left. Twenty minutes gone and Manchester City continue to probe but without any purpose. "Come on City," shout the home fans in encouragement. "When you look at the job Garry Monk did, yes they failed to score in recent games and they should be doing better. "But this is a guy who’d been with the club throughout the leagues, for 12 years. His first bump in a road and he’s out of a job." Encouraging start from the visitors. Has Garry Monk's departure given the players a surge in confidence? Or are they still battling for him? Down the other end and Wayne Routledge is behind the Manchester City defence again. On the right, he cuts the ball back to Gylfi Sigursson, and his shot is tipped over by Joe Hart. Good effort. It's that man David Silva who pops up on the left for Manchester City, he squares the ball to Wilfried Bony on the edge of the area, but his shot draws a comfortable save from Swans keeper Lukasz Fabianski. Right-back Angel Rangel has been recalled to the Swansea side and is up against Raheem Sterling today but he's coping well. It's just when David Silva joins his Manchester City team-mate on the left that the Swansea defender might have problems. So far City boss Manuel Pellegrini doesn't look too impressed. Garry Monk would have enjoyed this start so far, we are seeing some smart possession from the Swans. Ki Sung-yueng is in the thick of things, and Wayne Routledge is busy on the left side of a front three. That chance has settled Swansea, with Jack Cork seeing plenty of the ball early on. The home fans are urging their team forward. Swansea are in here. Their first attack plays in Wayne Routledge, who is clean through, but Joe Hart saves with his legs. That was a very good chance. Manchester City midfielder Raheem Sterling wins the ball back a bit too vigorously for the referee, who blows for a free-kick. That allows Swansea a chance to get a feel of the ball now. Manchester City camped in Swansea's half. David Silva seeing plenty of the ball. Each time the move breaks down, the hosts are quickly winning it back. Steady possession from Manchester City, who look to feed Raheem Sterling down the left. Careful so far in very wet conditions. It's been raining since dawn. Fresh from their team huddle, Swansea are ready. Referee Robert Madley blows on his whistle and Manchester City get us under way. Yes, we are on a bad run, but we won't be going to the Etihad just to make up the numbers and get the fixture out of the way while we wait for a new manager to come in. We need every point we can and we will strive to be competitive and get something out of a difficult game. Does Vincent Kompany's continued absence offer Swansea some hope? Don't forget that the Swans beat Manchester United at home in August and achieved a 2-2 draw at Chelsea in their first game of the season (not that that is saying much now!). Right the players are out, the crowd have listened to some pitch-side carol singing as the rain teems down and we are almost ready. "Ryan Giggs would be an excellent appointment for Swansea, but the big question is whether or not he would leave Manchester United when he’s heavily tipped to be their next manager. "Swansea is a great fit, they play great football, they've still got very good players. I think the Garry Monk situation is more than a poor run of form, there are several players in the dressing room not performing." Now I wouldn't be doing my job if I didn't do the obligatory 'move onto a manager's replacement within a blink of an eye' speculation. Apparently former Sunderland boss Gus Poyet quite fancies it. And then there is a Welshman, who some of our BBC pundits reckon could do a job. So will we see a response from the Swans today, or will Manchester City show no mercy as they seek to return to the top of the Premier League? Let us know what you think via #bbcfootball the BBC MOTD Facebook page or on text via 81111. Can Silva work his magic? So a bit of a surprise, perhaps, that Kevn de Bruyne is on the bench but maybe Wilfried Bony will have some extra fire in him as he aims to score against his former team. Manchester City have not been short of goals this season, despite missing the injured Sergio Aguero. For the record, De Bruyne and Raheem Sterling have nine and eight goals respectively this season, and four apiece in the Premier League. David Silva also scored in midweek in the 4-2 win over Borussia Monchengladbach so it's not as if the hosts are short of firepower. Manchester City boss Manuel Pellegrini drops Kevin de Bruyne to the bench as Wilfried Bony starts up front. Jesus Navas replaces Fabian Delph while Bacary Sagna is in for Aleksandar Kolarov. Caretaker Swans boss Alan Curtis makes three changes to Garry Monk's last selection for the 3-0 loss at home to Leicester. Angel Rangel and Federico Fernandez replace Kyle Naughton and Kyle Bartley in defence. Jack Cork comes into bolster midfield as Bafetimbi Gomis drops to the bench. 'Can Swansea spring a surprise? "It's a difficult game for Swansea but you've seen many times when a team is manager-less it pulls a result out of a bag. "Alan Curtis, he’s taken over the team under no illusions, it’s a tough game, but they have nothing to lose. Yes they need to get back on the points trail but nobody expects them to get anything." The general feeling is that Garry Monk was harshly treated after his success last season, but one win in 11 Premier League games was enough for him to bite the bullet. What sort of response will we see? Caretaker boss Alan Curtis said this week: "We all feel, staff and players, that we have let him down and we want to go a small way to rectifying that on Saturday. "Some may say it's too late because Garry's already gone, but we also have a massive duty and responsibility to the club and our supporters." Swansea are a point above the relegation zone. Do Swansea give a Monk? So are Swansea better off without former manager Garry Monk, who was sacked on Wednesday after leading them to their highest ever Premier League finish last season? Today we will start to get a few clues as caretaker Alan Curtis takes the Swans to Manchester City, fresh from their Champions League success in midweek. 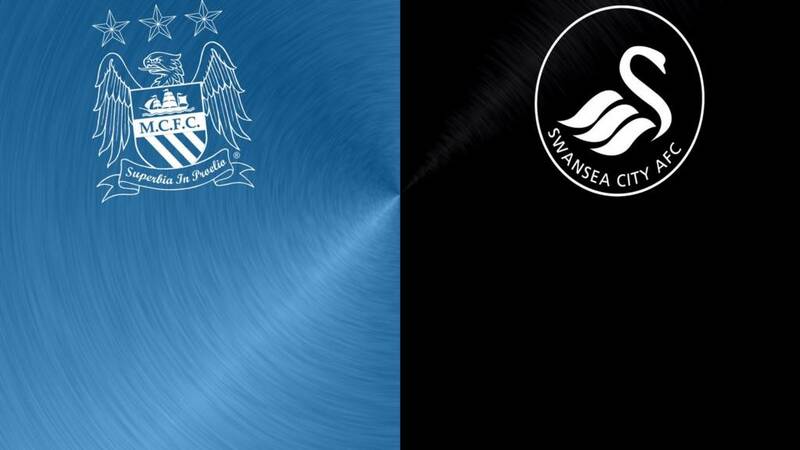 Welcome to our live page for Manchester City v Swansea. We’ll have text and Radio 5 live commentary here from 14:30 GMT. You can keep up to date with all the build-up to today’s games here.